Welcome to the Lady Bug Picnic! 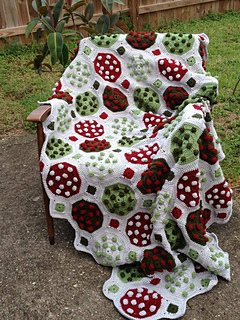 This afghan features hexagon motifs with dots crocheted right in for a fun & fantastical sensory overload! This pattern will be a fun challenge for any crocheter. It’s simple creation leaves plenty of room for individuality, and crazy color combinations. Generously sized at 47” x 74”….there’s lots of bubbly snuggles ahead!